John Riddiford has over thirty years’ experience in the water and natural resource management industry. 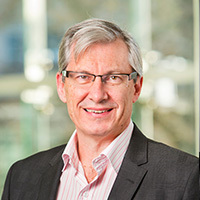 John is currently the Chair of the International Water Association’s Watershed and River Basin Management specialist group, the Executive Officer of Vic Catchments and he is a Fellow of the Australian Institute of Company Directors. John works part time as the Executive Officer for Vic Catchments. Vic Catchments is an unincorporated body representing the strategic and collegiate interests of the 10 regional Victorian Catchment Management Authorities and promotes excellence in Integrated Catchment Management. John also works part time for the International Water Association as Chair of the Watershed and River Basin Management specialist group. One of the key functions of this group is to undertake best practice research into water resource management options for growing global cities under the threat of climate change. He has had extensive water and NRM industry experience including three years as Executive Director at the Department of Environment and Primary Industries’ Water Group, over 13 years as CEO of the North East Catchment Management Authority and 10 years at Melbourne Water. A Fellow of the Australian Institute of Company Directors for over 15 years, John has extensive experience in board and governance processes. He is a former board member and chair of the Audit Committee of the Water Industry Super Fund. John has had significant experience working closely with ministers, including preparing cabinet submissions, and comprehensive stakeholder engagement in preparing government strategies and policies. As acting deputy secretary in charge of state-wide water policy in Victoria, he was the departmental representative on the State Flood Recovery Committee which oversaw $1.1 billion in flood recovery programs in Victoria.